Having just sown some sweet pea seeds in the garden last week, we are looking forward to one of our favorite flowers blooming in the summer. Sweet peas are a delicate and beautiful plant with an abundance of flowers and a very sweet scent. The sweet pea was developed by Henry Eckford via wikipedia a nurseryman of the Victorian era, which has been developed and evolved into the sweet peas, in many varieties we know today. 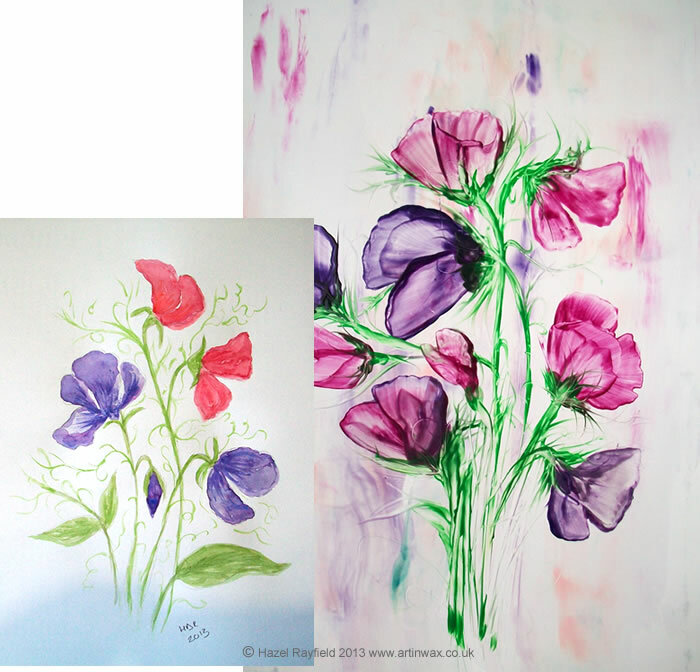 So I thought why not – Paint some Sweet Peas! I did some sketching and you can see how I got on below, I did my pencil drawing and then my encaustic painting. I like to sketch sometimes before stating my hot wax pictures, I use this as a guide more than something to copy from, but they help me keep on track so to speak as I get invloved with the wax. I then decided to doodle on the drawing with some watercolour paints and this is what I ended up with …….. This is the encaustic, hot wax version of the painting, it is an A4 encaustic painting on gloss card, it was created using some of my favorite colours, pinks and purples …… now just got to wait for the real flowers to grow and flower in the garden.